Discworld Emporium • View topic - Storytelling at the Nog! 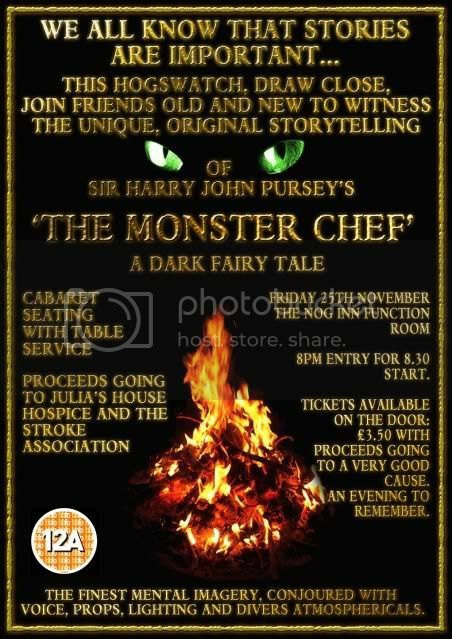 Come and support this fine young storyteller and two great causes to boot! Re: Storytelling at the Nog! Hi Mods, could this be stickied please? If you fancy attending, here are more details. Thankyou Ian, for the magnificent poster. Random-Hero wrote: Hi Mods, could this be stickied please? Sure thing, I set it up as a facebook event, publicly viewable so guessing its one of my profile/personal privacy settings? Had a look through the settings and you should be able to see it? Still denied access to your link it presents only a login page. using my phone or I would post a screen print. Last edited by Whos Wee Dug on Sat Nov 12, 2011 09:09 pm, edited 1 time in total. A couple of us were hoping to have dinner at the bear and then attend storytelling at the Nog, hmmm, shall take above advice and check what time dinner is... all very exciting with so much to get over excited about!!! There is a very fine line between a hobby and a mental illness. Buggered if I know where it is. It is the premiere of a new story, Kris, so it will never be the same as the first night. I will of course perform again another time at another venue though. Ditto on don't scare me please. For once, I should be hitting Wincanto fairly early, so I might just get to this!